The ozone layer resides in the stratosphere and surrounds the entire Earth. UV-B radiation (280- to 315- nanometer (nm) wavelength) from the Sun is partially absorbed in this layer. As a result, the amount of UV-B reaching Earth’s surface is greatly reduced. 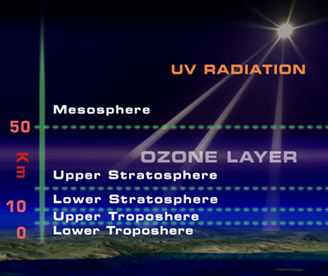 UV-A (315- to 400-nm wavelength) and other solar radiation are not strongly absorbed by the ozone layer. Human exposure to UV-B increases the risk of skin cancer, cataracts, and a suppressed immune system. UV-B exposure can also damage terrestrial plant life, single cell organisms, and aquatic ecosystems. In the past 60 years or so human activity has contributed to the deterioration of the ozone layer. Only 10 or less of every million molecules of air are ozone. The majority of these ozone molecules resides in a layer between 10 and 40 kilometers (6 and 25 miles) above the Earth's surface in the stratosphere. Each spring in the stratosphere over Antarctica (Spring in the southern hemisphere is from September through November. ), atmospheric ozone is rapidly destroyed by chemical processes. Over the course of two to three months, approximately 50% of the total column amount of ozone in the atmosphere disappears. At some levels, the losses approach 90%. This has come to be called the Antarctic ozone hole. In spring, temperatures begin to rise, the ice evaporates, and the ozone layer starts to recover. 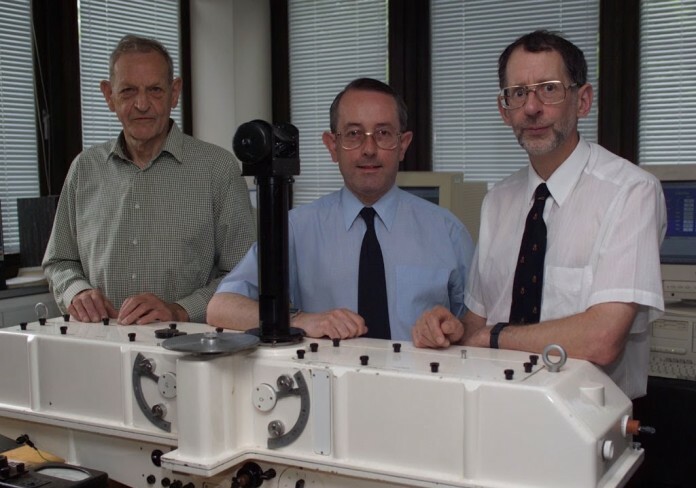 In 1984 British Antarctic Survey scientists, Joesph Farman , Brian Gardiner, and Jonathan Shanklin, discovered a recurring springtime Antarctic ozone hole . 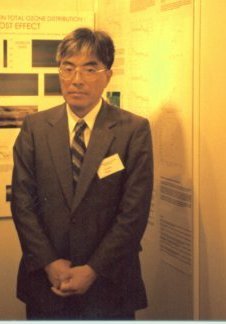 Their paper was published in Nature , May 1985, the study summarized data that had been collected by the British Antarctic Survey showing that ozone levels had dropped to 10% below normal January levels for Antarctica. The ozone "hole" is really a reduction in concentrations of ozone high above the earth in the stratosphere. The ozone hole is defined geographically as the area wherein the total ozone amount is less than 220 Dobson Units. The ozone hole has steadily grown in size (up to 27 million sq. km.) and length of existence (from August through early December) over the past two decades. After a series of rigorous meetings and negotiations, the Montreal Protocol on Substances that Deplete the Ozone Layer was finally agreed upon on 16 september 1987 at the Headquarters of the International Civil Aviation Organization in Montreal. The Montreal Protocol stipulates that the production and consumption of compounds that deplete ozone in the stratosphere--chlorofluorocarbons (CFCs), halons, carbon tetrachloride, and methyl chloroform--are to be phased out by 2000 (2005 for methyl chloroform). Scientific theory and evidence suggest that, once emitted to the atmosphere, these compounds could significantly deplete the stratospheric ozone layer that shields the planet from damaging UV-B radiation. Man-made chlorines, primarily chloroflourobcarbons (CFCs), contribute to the thinning of the ozone layer and allow larger quantities of harmful ultraviolet rays to reach the earth.